Are you looking for a crowd-pleasing Keto appetizer? 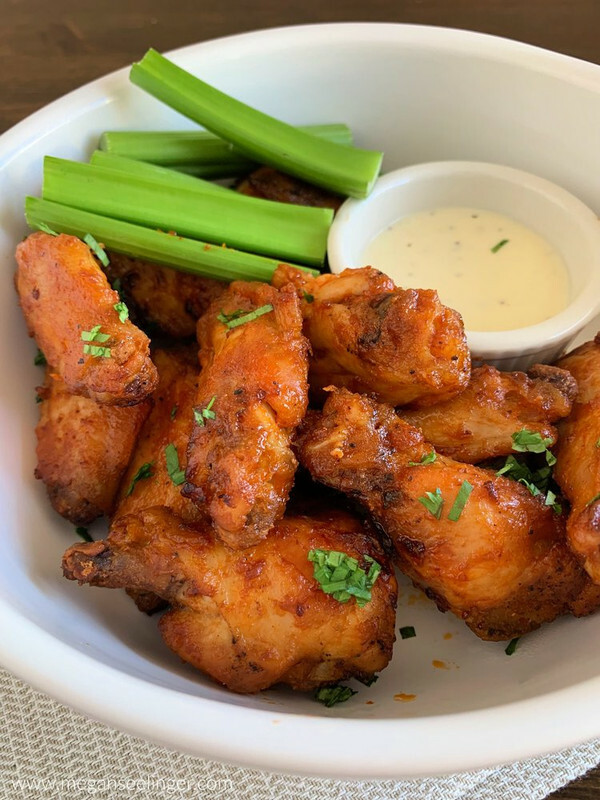 These Keto Buffalo Wings are easy to prepare in your instant pot, sweet, spicy, and buttery goodness! Keto chicken wing appetizers are always a party favorite, but sauces that taste this good are usually loaded with sugar. These low carb chicken wings got the sweetness with a little spice, yet still Keto friendly! As far as cooking the Keto Buffalo Wings you have two easy options, baking or pressure cooking them (in an instant pot or Ninja Foodi). Either way, I recommend tossing them in the air fryer to crisp them up too. First, combine the Franks Original Hot Sauce, brown sugar substitute ( I used Lakanto Golden Monkfruit), garlic powder, smoked paprika and Butter in a small saucepan over high heat. Bring the mixture to a boil and then set aside. Season the wings with salt and pepper and it’s time to cook them. In the pressure cooker, instant pot, Ninja Foodi, add 1 cup of water to the pressure cooker, using the crisper basket add wings and pressure cook on high for 5 minutes. Once your wings are done baking or pressure cooking toss them in the hot sauce and butter mixture. Now you’ll want to air fry the Wings to get them nice and crispy. If you are using a Ninja Foodi be sure to dump out the water. Air fry the wings at 390 F for 8 minutes, remove and toss in the sauce again. Air fry for an additional 8 minutes. If there is any sauce left, you can toss in the sauce again before eating. By the way, I recently got this Ninja Foodi and its amazing! First off, I was able to give away my veggie steamer, rice cooker, and air fryer, which made me a happy girl because I was starting to feel like so much of my pantry space was being taken up by all the different kitchen gadgets! The Ninja Foodi literally does it all… dehydrator, slow cooker, pressure cooker, you can sautee in it and of course steam and air fry. Even if it isn’t something you want to spend the money on right now, put it on your birthday and Christmas gift wish list! I'm convinced every busy woman needs this thing in their life ASAP! As you know Keto should be a low net carb, high fat, moderate protein diet. With that being said on a daily basis I wouldn’t eat a dozen Keto chicken wings because that would probably be higher in protein than advised to eat per meal, however, its obviously a better choice for you to eat all the Keto Buffalo wings instead of an entire bag of potatoes chips at the Super Bowl party! If you are making them for lunch I recommend only eating a few and saving the rest for another meal. Check out this article by Dr. Perlmutter if you’d like to learn more about proper portion sizes for Keto! Keto Chicken Wings in the instant pot are sure to be a party favorite and of course easy to prepare. These buffalo wings have a sweet, buttery, and a mild spicy flavor, but still, low carb chicken wings that everyone will love. Remove from the pressure cooker and toss in the buffalo sauce you previously boiled. Preheat oven to 450 F and line a 9 X 13 baking sheet with foil. In a small saucepan combine Frank’s Red Hot Original Sauce, Lakanto Golden Monkfruit Sweetener, Butter, garlic powder and paprika. Bring to a boil.